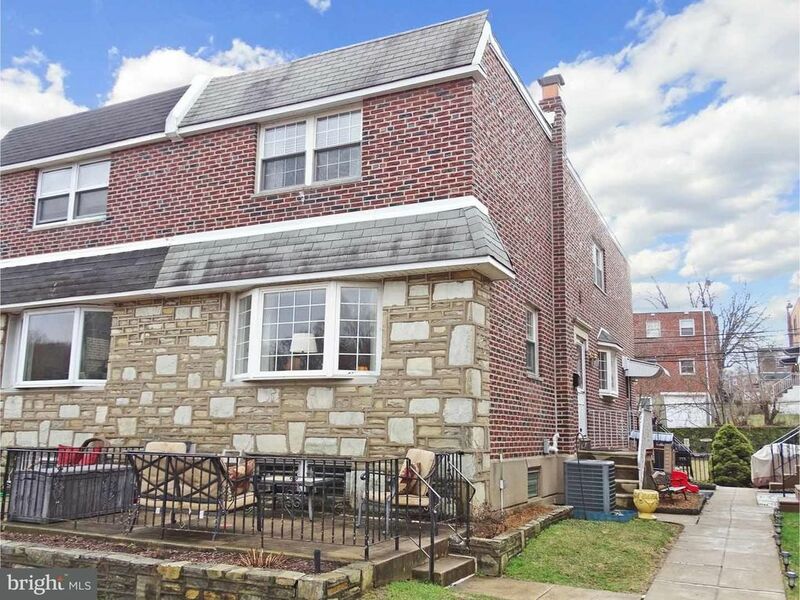 Beautifully updated and upgraded twin at great location facing Pennypack Park, in move-in condition. Excellent curb appeal with timeless stone and brick exterior, welcoming front patio, and colorful flower beds. Enter tiled foyer leading to the living room with exposed hardwood floors, crown molding, decorative shelves, and newer vinyl windows and bay window. The hardwood floors move into the adjoining dining room, also brightened by bay window. Totally remodeled kitchen (2016) features tiled, wood-look floor, soft-close cabinetry, quartz counter-tops, subway-design tiled back-splash, built-in bench seats with storage, and doors to the finished basement and side yard. Appliances includes a Kenmore dishwasher, smooth-surface range with self-clean oven, built-in microwave oven, trash compactor, and waste disposal. Upstairs discover 3 bedrooms all with exposed hardwood floors and ample closet space, 2 with lighted ceiling fans. The master bedroom has a private bath, and the hall bath has been updated with glazed tub, pedestal sink, and tiled floor and surround. The basement has a large recreation area with closeted storage, powder room, laundry room, and back door to yard. The 1-car attached garage offers a new garage door (2017) and garage door opener. Worth Mentioning: rubber roof installed in 2009, re-coated (2012 & 2014); newer water heater (2013); hardwood floors refinished(2009, 2011 & 2014); newer water heater (2013); newer rear meal door and storm door (2013); 95% efficient HVAC (2010); and additional insulation in crawl space (2008). This property won't last long!